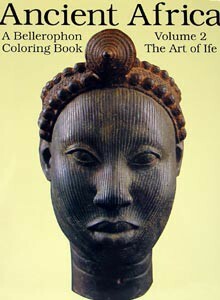 A Coloring Book of Ancient Africa, Book 2, (Ife) . Terracotta figures of the kingdom of IFE, 11th - 15th centuries, with their great Onis (kings) and high ladies of the court. Ancient Africa, Vol. 2. From Bellerophon Books.